The Shining City … On The Sea? At first glance, they look like a couple of giant inflatable garden chairs that have washed out to sea. But they are, apparently, the ultimate solution to rapidly rising sea levels. 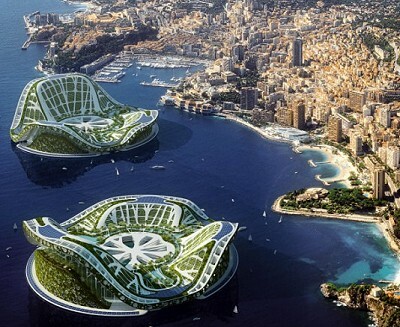 This computer-generated image shows two floating cities, each with enough room for 50,000 inhabitants. Based on the design of a lilypad, they could be used as a permanent refuge for those whose homes have been covered in water. Major cities including London, New York and Tokyo are seen as being at huge risk from oceans which could rise by as much as 3ft by the end of this century. This solution, by the award-winning Belgian architect Vincent Callebaut, is designed to be a new place to live for those whose homelands have been wiped out. 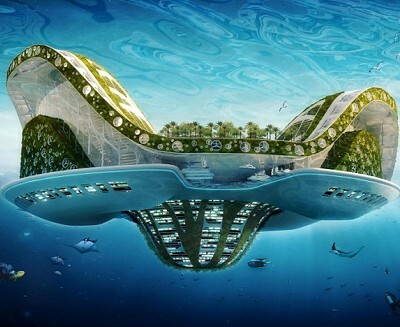 The ‘Lilypad City’ would float around the world as an independent and fully self-sustainable home. With a lake at its centre to collect and purify rainwater, it would be accessed by three separate marinas and feature artificial mountains to offer the inhabitants a change of scenery from the seascape. Power for the central accommodation hub is provided through a series of renewable energy sources including solar panels on the mountain sides, wind turbines and a power station to harness the energy of the waves. Mr Callebaut said: ‘The design of the city is inspired by the shape of the great Amazonia Victoria Regia lilypad. Some countries spend billions of pounds working on making their beaches and dams bigger and stronger. The architect, who has yet to estimate a cost for his design, added: ‘It’s an amphibious city without any roads or any cars. The whole city is covered by plants housed in suspended gardens. Really? I have a better idea: Why not just go ahead and create these now so we can ship off all the global warming alarmists in the world who don’t practice what they preach about conservation, like The Goracle and John Edwards (for starters)? That would have the effect of creating a more “harmonious coexistence of humans and nature” stateside as well. Why, these things could become so self-sustaining that they could turn from floating cities into – gasp – countries of their own! And then maybe, just maybe The Goracle could find a place where he could finally be elected president. Is it just me, or do the windmills in the image all kinda sorta look like peace signs? Centred around a lake which collects and then purifies rain water, the Lilypad will drift around the world following the ocean currents and streams. It will “drift around the world”? Even better! My only question is: will it be stable and sturdy enough to handle not just the global warming alarmists themselves, but their massive egos, too? It sounds like the architect has thought of everything, so I’ll just have to assume he factored that into the equation as well. I see no reason to delay construction of lilypad cities any longer. Let’s get started!